East London Printmakers invites you to an Open Studio On 5th December, First Thursday, from 6 'til late ELP is opening its doors to celebrate the festive season and a great year full of fantastic printmaking! We will be launching the ELP annual Box Set as well as having aàÂ £10 proof sale and Christmas drinks on us!àÂ East London Printmakers is a modern printàÂ studio, managed by a co-operative of artist printmakers based Hackney.àÂ It was founded as a printmaking resource to promote the creative potential of practising artists and individuals in the local community.àÂ The spaciousàÂ studioàÂ providesàÂ openàÂ access facilities for screenprinting, etching and relief printing. A wide variety of courses are also available, where practising printmakers offer their expertise in the subject. Keep an eye on our blogàÂ for updates on the event. 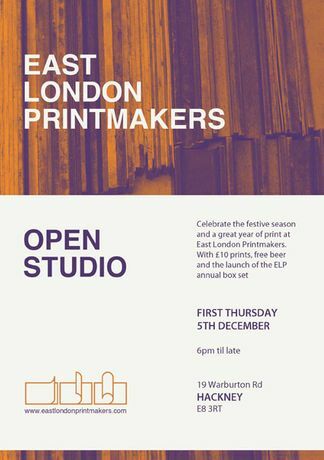 http://eastlondonprintmakers.tumblr.com We look forward to seeing you there!